Since both of us work from home it’s a real struggle not to want to eat out every night. We want to “do” something, to make it an event but eating out daily is just too expensive. Plus I don’t know about you but I always over eat and order way more unhealthy foods than what we eat at home. And the thing is, we enjoy the food I cook and with a little thought it’s easy to make even meals at home something to look forward to. For me if I have a meal plan for the week that I have shopped for I’m WAY more likely to eat at home and stick to the plan. 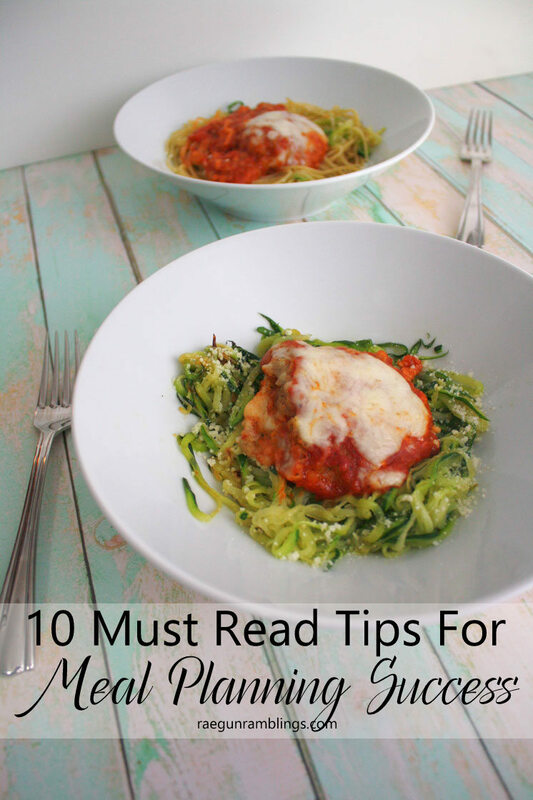 So today I’m sharing 10 tips for meal planning success. 1. Pay attention to the family schedule (and special events). Each week look and think about what this week has in store for you. Are there weekly activities like the soccer or piano that will occupy your time? What time will you be getting home? How much time do you really have that day to prep dinner? Factor all of that in when you are selecting your meal for that day. Also think about if you have any special events that will change your normal schedule or that might have you eating out (whether this is grabbing a bite after being out for the evening or eating at the home of relatives). 2. Make a list or pinterest board of recipes. I highly suggest making yourself a few pinterest boards. One for tried and true recipes that you would happily make again. You can even upload your own picture to represent a family favorite that isn’t somewhere on the internet. For example if you guys enjoy taco night, next time you have tacos snap a picture and upload it to your board so when you’re planning it’s right there in front of you. Also make at least one for recipes you want to try. I have a few including yummy savory ideas, seafood recipes, and crock pot recipes. You can also just make yourself lists but I find pinterest is so easy since it’s visual and I’m always finding stuff I want to try throughout the week and I just pin them as I see them. 3.Take advantage of pre-made and convenience foods. 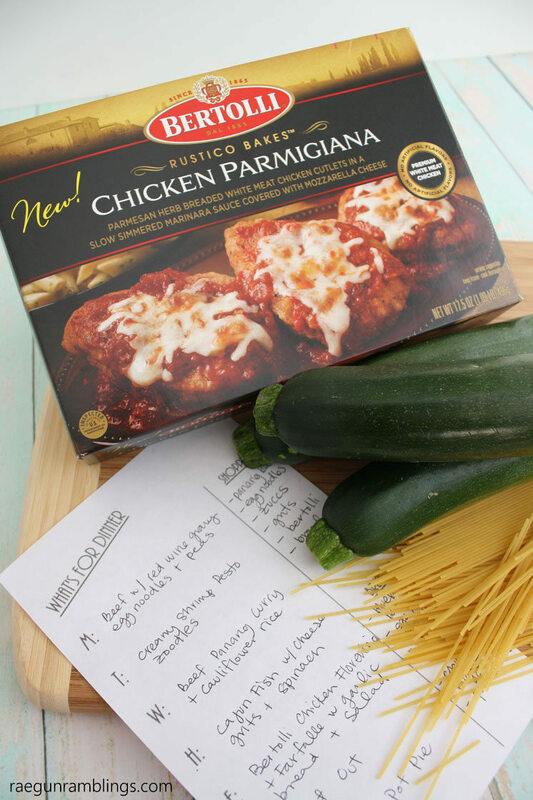 Whether you are using something like this new Bertolli Chicken Parm Bakes or even a my freezer friendly enchilada recipe that you had in your freezer, I recommend using some just heat up type of options. I found the Chicken Parmigiani Bake as well as lot of other yummy looking Bertolli frozen family dinners for a great price at Smiths. There are so many great convenience foods these days that are just as simple as popping in the oven or heating in a skillet. I use a few every week. I like to pair them with a little something extra so for this meal I used frozen chicken parmesan that just needed to be baked as well as frozen bread dough that I let rise and I sprayed with oil and sprinkled with seasoning. 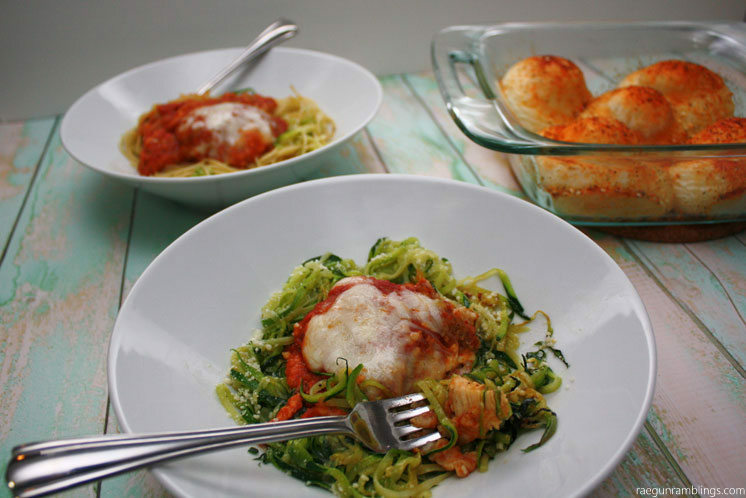 Then I paired them with some basic zoodles for me and a comb of zoodles and traditional pasta for my husband and we had a delightful complete meal. In a nonstick skillet (nonstick is VERY important) over medium high heat spray with oil and saute the zucchini noodles until cooked through. 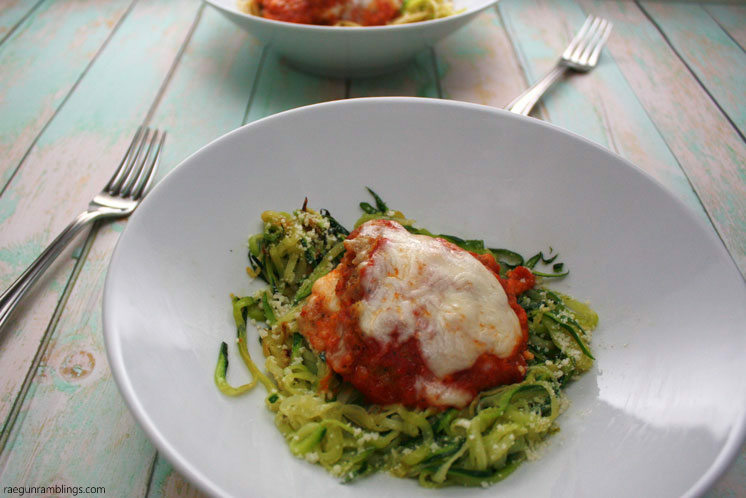 I like mine softer but it’s totally a matter of preference.If it’s your first time making zoodles just taste it often to see when you like it. Season with salt and pepper and transfer to your plate. 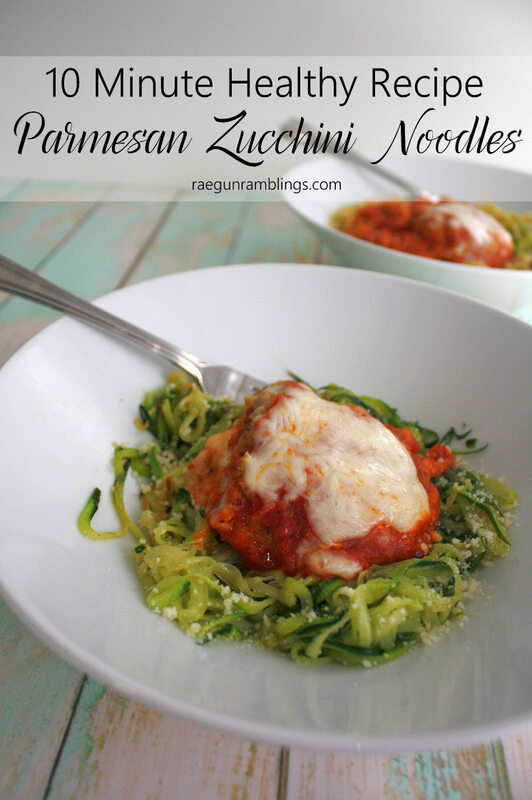 Top each serving with 1 tsp grated Parmesan. Feel free to eat as is or mix with pasta noodles for more traditional pallets. 4. Try to shop once for everything you need for the week. I found the frozen chicken Parmesan and the zucchini for this meal all at my local Smiths and tried to grab everything else I needed for the week while I was there. I know that for me if I have the ingredients, especially produce or fresh meat I’m more likely not to decide to eat out since I’m worried about them going bad. 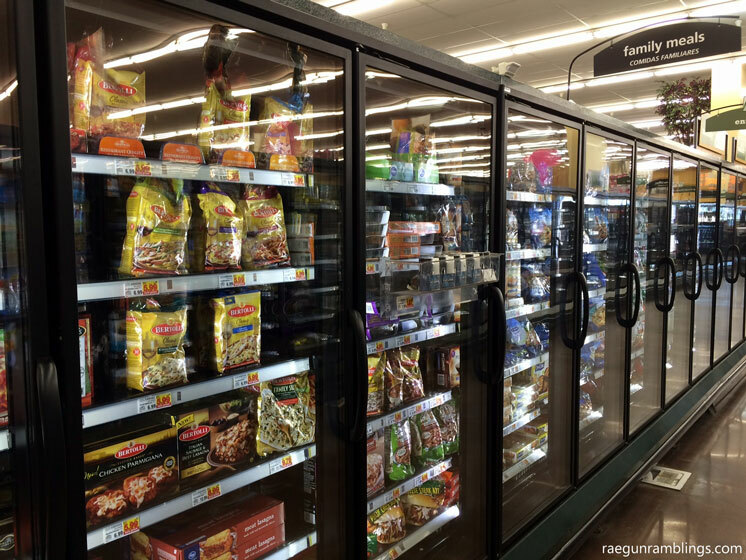 Likewise if you’re using any frozen items that will need to thaw, take them out and put them in the refrigerator the night before so you limit your excuses for the next day. I think it’s important to assign specific meals to days since this helps me think in concrete terms about our schedule and if anything needs to be thawed or thrown in the crock pot. BUT if you get home at the end of the day and just don’t feel like what’s on the menu by all means switch for one of the other days’ meals. After all you did all your shopping already so you can easily make that swap. 6. Plan on an “eat out” or “leftovers” day. We love eating out so I always plan in an eat out day. Sometimes it’s connected to an event and sometimes it’s just there for when we feel like we have to get out of the house or I just don’t feel like cooking that night. Likewise I know lots of people account for eating leftovers for a day or two. If you are leftover eaters (we aren’t, leftovers die a slow death in our fridge) then by all means factor that in. 7. Try to plan some double duty meals. I like to plan means that work overtime. I think the easiest way of doing this is by making some crock pot meat early in the week and then repurposing it into a meal later in the week. It’s simple to turn a roast (or really any kind of meat) into tacos, Stroganof, enchiladas, or even soup. Another easy idea is to make a double batch of your favorite freezer friendly meals (like my Stuffed Shells or Knock off Olive Garden Zuppa Toscana) and then freeze a batch for a later week. 8. Build in diversity and make it an event. I think one of the biggest reasons people fall off of meal planning is that they get into a rut. Make sure to try new things. This is where those pinterest boards come in handy. Just allow yourself more time when trying a recipe for the first time and I always like to serve it along size something tried and true just in case. We are huge foodies. The baby is a GREAT eater and I think a big part of that is that we make dinner an event. We look forward to it, we all eat the same thing, we talk about the food, and of course we try to make everything we eat and serve our little one delicious. 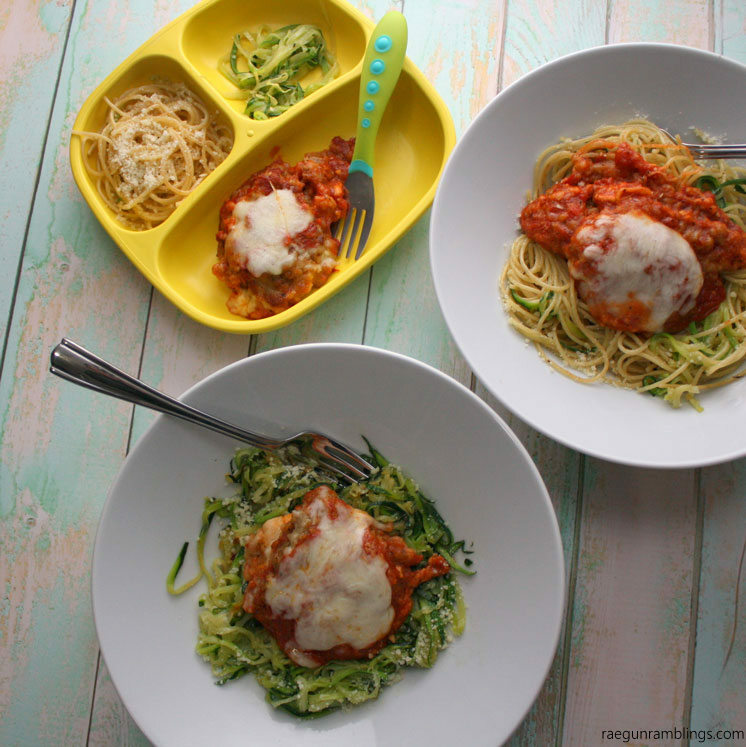 When you’re busy it’s easy to just forget to value meal time so that is a perfect oppertunity to use the pre-made stuff like the chicken Parmesan in these pictures or a previously homemade dish. That way you can really focus on a whole meal and time together and enjoy the food! 9. Keep your eyes on the goal. Remember how much you will save. By eating at home even if you’re very spendy with ingredient you’ll save tons of money over eating out even if eating out is just fast food. You will also be saving your health. Whether you are content with your weight or trying to cut some calories, when you do the cooking you know exactly what goes into it and you can make sure that you feed your family veggies and a balance of nutrients. Also with the crazy serving sizes at restaurants these days is SO hard not to over eat even if you’re sure the particular foods are good options. Last but most importantly write it down. Every week I sit down at the computer and write out my weekly menu. I actually send it out in my newsletters with links to the recipes on Thursdays this helps me to stay accountable and it’s just fun to share. When I’m at the store I pull it up on my phone. A lot of times I write my list on good old paper since I’m totally a paper and pen girl. 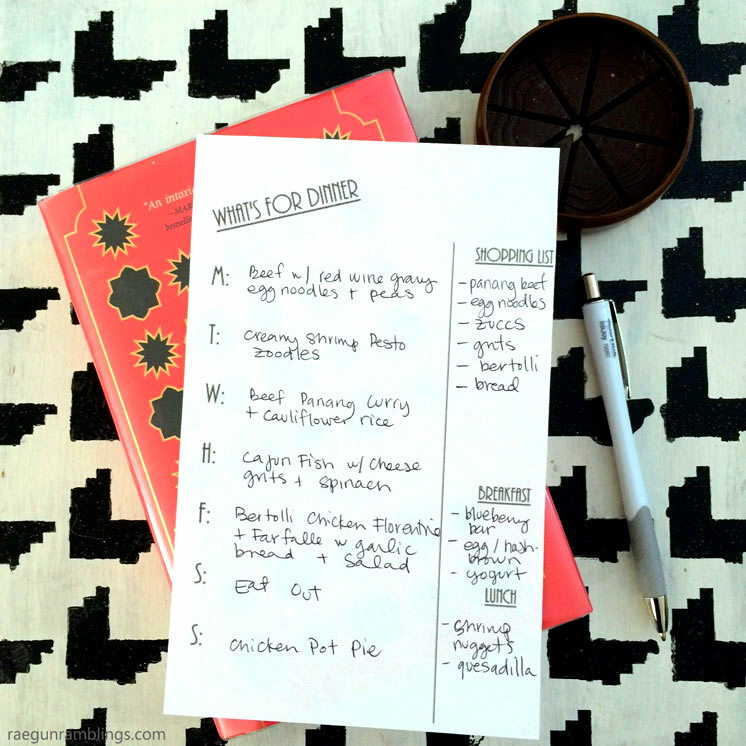 I even made these meal planning printable that you can use as well. Sometimes I’ll snap a photo of my plan and share it on Instagram. People love it. Whether you want to be public or not you should definitely write down your meal plan. Personally I highly recommend sharing it with someone even if that is just someone in your household, but really I bet your friends would love to see it on social media typed up or as a pic! I hope those ideas were helpful. For even more help I’ve made a printable meal planning sheet. This is available to my newsletter subscribers. Just go ahead and subscribe below in the teal box and once you confirm your email you will receive code to access the printable! Tell me how you are ready to get your meal planning under control will you start with a few convenience foods, new pinterest boards, let me know! And remember you can find Bertolli items at some of the lowest prices of the year in a Kroger or Kroger banner store near you. Kroger banners include Fred Meyer, Smiths, Frys, Dillions, King Soopers, City Market, and QFC. Find a store near you. Thanks. We are all about food in our house! I’ve been planning out our weekly meals since the beginning of the year and it’s been so helpful! 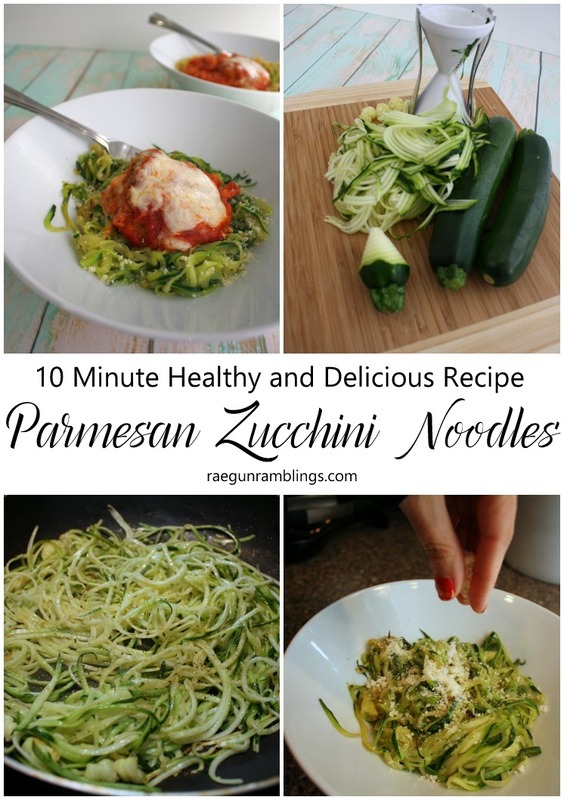 Your zoodles recipe sounds delicious! Thanks for sharing with Merry Monday this week! 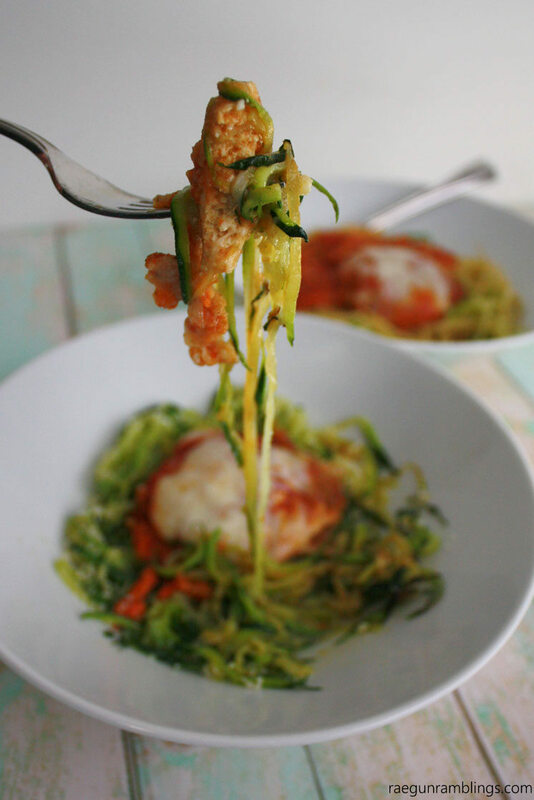 Zoodles are so friggin good! :) I wanna make some with salmon today! They are seriously my favorite. I haven’t had them with salmon yet I need to fix that! I NEED TO MEAL PLAN. Will you make me meal plan? I feel like it would change my life. And on my first week’s plan….I want this!! It looks seriously amazing. Great tips! I need to seriously work on meal planning, so thanks for sharing! This recipe look so yummy! I’ve had a zoodle maker for over a year and have never taken it out of it’s box. Shame on me. pull that thing out of the box!!! !